Down and Dirty. Sad to say, that's an apt description of many intercity passenger trains in the late 1960s -- and something many of today's readers of this page were fortunate to have missed. Here are two photos from 1968. On the left is MoPac Train 27-28, which ran between Fort Worth and El Paso, Texas, sitting in the El Paso station. 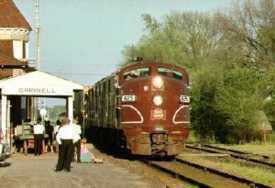 On the right is Penn Central's Chicago-New York run, the Admiral, photographed at Adams Station, New Jersey. A very grimy set of coaches in very unburnished Tuscan red, the Admiral but three years earlier featured sleeping cars and a diner lounge when run by the Pennsy. 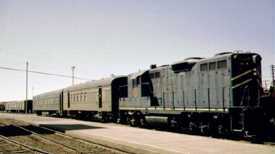 And its elegant GG1 was not bedecked by the horrific PC logo. Having just had to wait four hours at a nearby airport for a friend who missed a connection, I developed a deeper appreciation for railroad stations. Great diversity of people coming and going, no security barriers, color, architectural grandeur -- or pretense -- and, with a few exceptions, close proximity to what's coming and going. Here are two favorites from 1982-3. 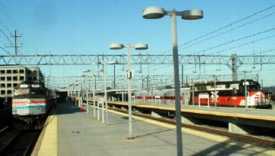 On the left is the Hoboken terminus for Jersey Transit, a station which has been refurbished recently. It was the home of the many trains my father and grandfather before him rode to work for many years, and once the end point for the DL&W's and E-L's long-distance trains to Buffalo and Chicago. On the right is London Paddington, currently infamous for terrible wrecks. A beehive of activity, it is the terminus for trains to Britain's West Country -- Bristol, Bath, Oxford, Devon, Cornwall -- and a huge fleet of 125 High Speed Trains. 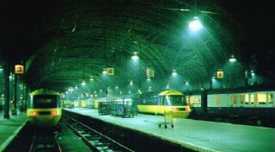 Very recently it came to serve as the London station for a new Healthrow airport express which gets passengers from Central London to the huge international airport in fifteen minutes -- a policy and engineering feat that shames the way Americans get to and from airports. Amtrak's announcement that it will be starting up a new Chicago - Des Moines train sent me scurrying to my Rock Island collection. The photo on the left is of the Rock's #7, arriving in Grinnell, Iowa, late in the 60's, probably 1968, on its run from Chicago to Omaha. #7 was originally the Rocky Mountain Rocket, which ran from Chicago to Denver and Colorado Springs, one of three trains to serve the college town of Grinnell each day. At the time of my photo the schedule was reduced to one train per day and long gone were the dining, sleeper and lounge cars that once graced the route. 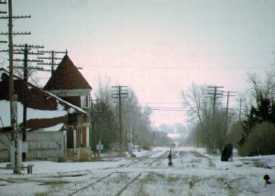 When I returned to Grinnell in 1982 the depot, which at one time served trains on the Minneapolis and St. Louis [or as Grinnell College students called it, The Missing and Still Lost] on its north-south route, was abandoned. In its hey day it was a hopping little place, always cheered by the tapping of Morse code. I don't know what's become of it, but it is good to know that Amtrak will be back on the route, now the Iowa Interstate, even if in the dead of night. Here are two photos taken April 14, 2000, in New Haven, Connecticut. On the left is Amtrak #475, which I picked up in Windsor on its way from Springfield, MA. 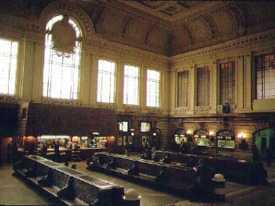 to New Haven, where it hooks up with #175 from Boston and continues on to Washington. It arrived next to a Connecticut Commuter Rail Shoreline East, engine bedecked in New Haven Railroad livery. 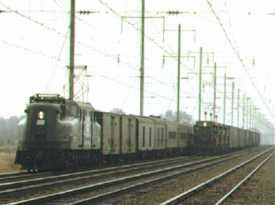 On the right, is #142, the Inland Route train from Washington to Boston via Springfield. New Haven is a great place to watch Amtrak, New Haven-Grand Central locals, and the Commuter Rail locals which ply the coastline up to New London. And it can be interesting for the photographer. Connecticut Commuter Rail names each car in huge block letters, my favorite being Harriet Beecher Stowe. And then there is Amtrak's dizzy change of paint schemes, a rather sickly pale pea Acela Regional green [which fades and shows dirt] replacing the bold Northeast Direct colors of last year. The good news is that all my trains were spotless, on time, the food is more diverse, and the crowds coming and going were huge. Less encouraging were rude station personnel in New York [the only rudeness we encountered in a long Big Apple weekend], long lines to the single cafe attendant, litter on the New Haven platforms and poor equipment assignments to handle passenger load on a college holiday weekend.